I'm enjoying it so far. Couldn't wait to get to something besides the border so I'm going on to a tree for now. I also have tons of other things I need to be doing (like a few Christmas gifts and I'll be moving in the next couple of months) so I may be slow at listing this as a finish. I think I'm going to use this piece as a sort of commemorative neighborhood piece. We've been forced to sell the home we've lived in for the past 17 years to the State of Utah for a road project. We've put an offer in on a new home just a couple of blocks away. I was thinking of putting the name of streets I've lived on in my life under each home. I've lived for a significant amount of years in 4 different homes..so I'm thinking of my childhood home: South Main; my first home as a married woman: Walnut Circle; this home: 11400 South; and my new home: Gracie View Lane. I'm thinking about putting each address under one of the homes. What do you think? I think it might be kind-of fun...so we'll see once I get everything stitched...what I will finally decide. Thanks for looking and listening! 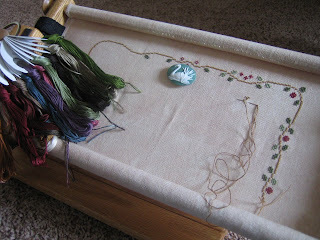 For now...back to stitching! Wooohooo I have completed construction on two more of the houses so just one more to go. It has been a long time since I have posted an update, but this is where I am at. 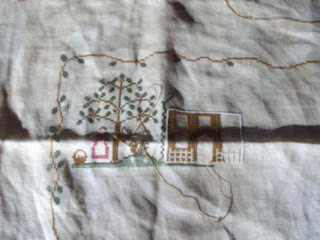 I am slowly working through this sampler, having about 3 or 4 other large pieces that I am also working on, to say nothing of the exchanges! Sorry about the quality of the picture, it has been folded for several weeks. 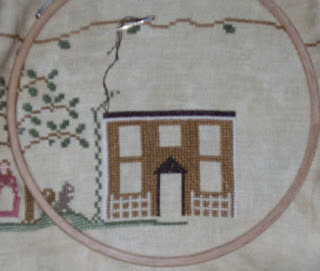 I am working on this as part of the weekly SAL over at the Let's Stitch Blog, and have not touched it since I last participated on the SAL several weeks ago.